I usually cook salmon the same way - seasoned with Rosemary Garlic Seasoning and baked in a hot cast iron skillet with a little olive oil. It's really good that way, but when I saw this recipe on Pinterest, I thought it would be nice to try something different. Heat oil in skillet over medium high heat. Season both sides of salmon with salt and pepper. Add salmon to skillet and cook 1 to 2 minutes per side, until golden brown. While the salmon is cooking, whisk together honey, vinegar and red pepper flakes in a small bowl. Add vinegar mixture to skillet and simmer until fish is fork-tender and liquid reduces and thickens, about 5 minutes. For a thicker, reduced sauce, simmer for 5 to 10 additional minutes. Just make sure you don't overcook the salmon. 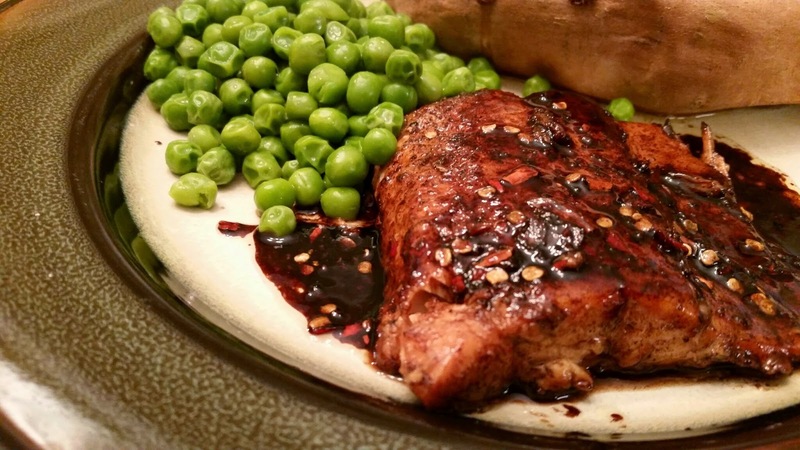 This is really simple to make and a delicious change. 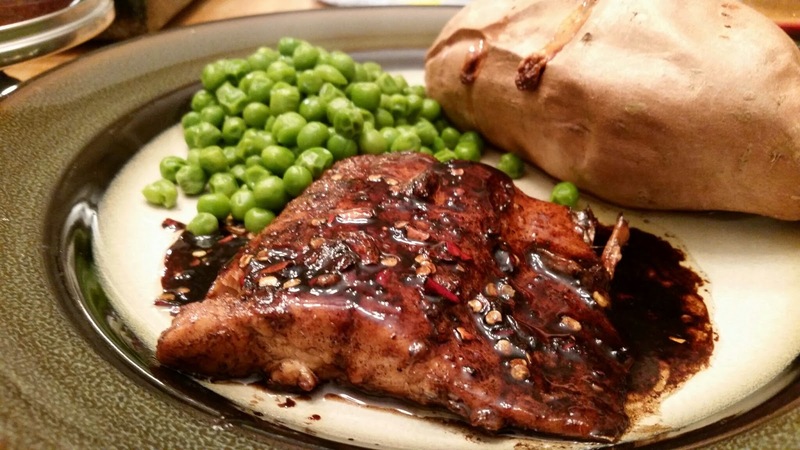 The flavors are really good, and I will definitely be making this again! I may cut the red pepper flakes down a bit - I already cut them down from 1 tsp. to 1/2 because, even though I like spicy food, my husband really doesn't, and this still had a bit of a kick to it. I liked it, but it may have been a bit much for him. I received a free digital copy of the new cookbook Make Ahead Bread: 100 Recipes for Melt-in-Your-Mouth Fresh Bread Every Day by Donna Currie through NetGalley. I have been baking bread for as long as I can remember, but I never get tired of looking at and trying new recipes, which is why I was happy to take a look at this book. Just flipping through it and looking at the gorgeous pictures makes me want to try every single one of the recipes. The book begins with a chapter on the basics of bread-making, including ingredients and equipment. Even though I've been baking bread for ages, I learned a thing or two. I love the premise of the book - breaking up the process of baking bread into multiple parts, meaning that the bulk of the actual work - the mixing, kneading and forming - can be done whenever the baker has time. It means that, no matter how busy your schedule may be, you can still make and enjoy homemade bread. Mixing, kneading, and the first rise are done on the first day - Prep Day. Then the magical step in the process is refrigeration - the dough is kept in the refrigerator for anywhere from 8 to 24 hours, or longer - which improves both the flavor and the texture of the bread. As well as allowing the baker to bake the bread on his or her own schedule. Baking Day is usually pretty simple - remove the bread from the refrigerator and bake it. And then enjoy, of course! I bake sourdough most of the time anymore, which requires a longer rise time than breads made with active dry yeast, so I know that extra time does something special to the bread. The author does include a few sourdough recipes and a very thorough explanation of starting your own sourdough starter. There are also a few gluten free recipes included. Page 38 - Stuffing Bread with Dried Cranberries - because cranberries are definitely my thing. I'm sure I will be making some variation of several of these! I also enjoyed all the pictures throughout this book. While I can picture a lot of recipes just by reading through them, having gorgeous full-color pictures in a cookbook definitely take it to the next level. I do wish there was a picture for every recipe and that the pictures were better labeled, (sometimes the picture is on the page before the recipe; sometimes on the page after) but it wasn't too hard to figure out which picture was for which recipe. It also would have been nice to see the book start with the most basic loaf - something for people who have never really baked bread to ease into it with - and for the recipes to be somehow labeled for difficulty, so those same people could easily pick some simpler recipes. I don't think any of the recipes look terribly hard, and Currie does a good job of breaking them into manageable pieces and sharing handy information and tips for success, but I would hate for someone to be turned off of bread making because the recipe that was a bit harder than they were ready for. For those of us who have been baking bread for a while or those who would bake bread if only they had the time, this book is an excellent resource. I found this recipe on Pinterest - whatever did we do before Pinterest? I have made it multiple times. This may be my favorite drink of all time. Or at least for now, or when I'm not drinking a Hot Toddy with Jack Daniels. Those are pretty good, too. Squeeze the juice from the grapefruit and half of the lime. Cut a wedge from the other lime half and rub the rim of a glass. Put a small amount of Himalayan salt on a dish and dip the glass in it to coat the rim with salt. Place juice, tequila, triple sec, simple syrup, and ice in blender and blend until desired consistency. Pour into prepared glass, garnish with lime wedge, and enjoy. 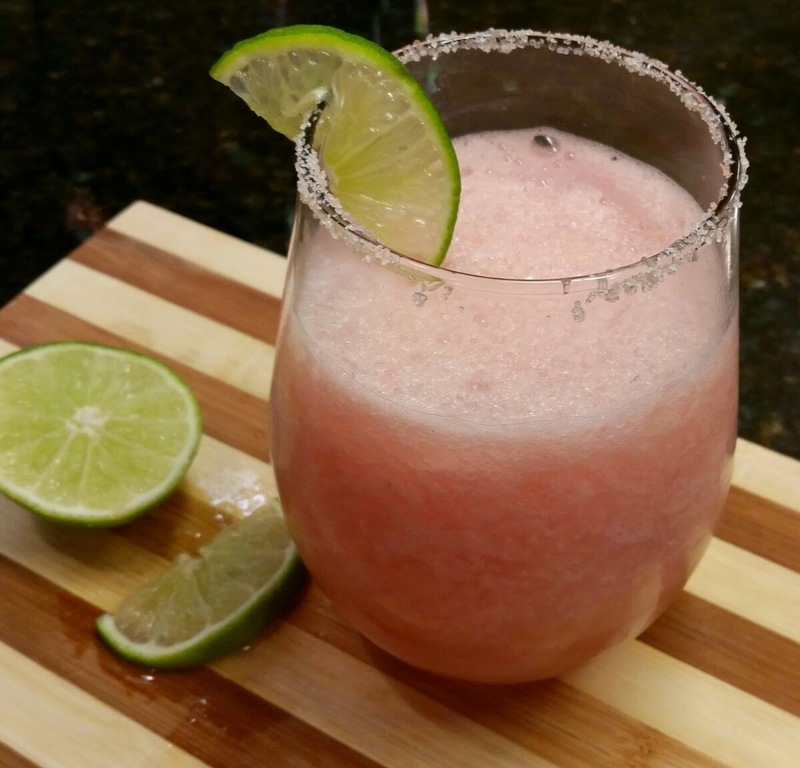 I like my margaritas frozen, but you could also just stir everything together or shake it in a cocktail shaker and serve over ice. If you don't have Himalayan Salt, you can use regular sea salt or margarita salt. I've also seen people put sugar on their grapefruit, so I bet a sugared rim would be good with this, too. 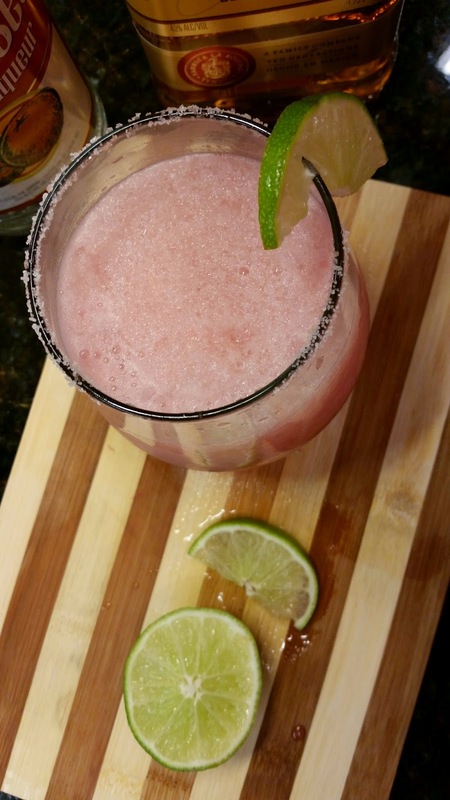 I'm kinda partial to the salt - it might be my favorite part of any margarita, or maybe it just goes so perfectly with the tequila - so if you do try this with the sugar, please let me know how it turned out. If you regularly buy ROLO Chewy Caramels in Milk Chocolate, you have probably seen this recipe. I've only recently tried them, and they are really yummy - chocolate, caramel, what's not to love? But, it was only after we'd finished the bag that I noticed the recipe on the back for these ROLO Pretzel Delights. They sounded really yummy - chocolate, caramel, and crunchy, salty pretzels. So I bought another bag just so I could try these. Yep, they really are as good as they sound! And so easy. Place one pretzel for each treat desired on cookie sheet. Top each pretzel with one unwrapped ROLO. Bake 3 to 5 minutes or until chocolate begins to soften, but not melt. 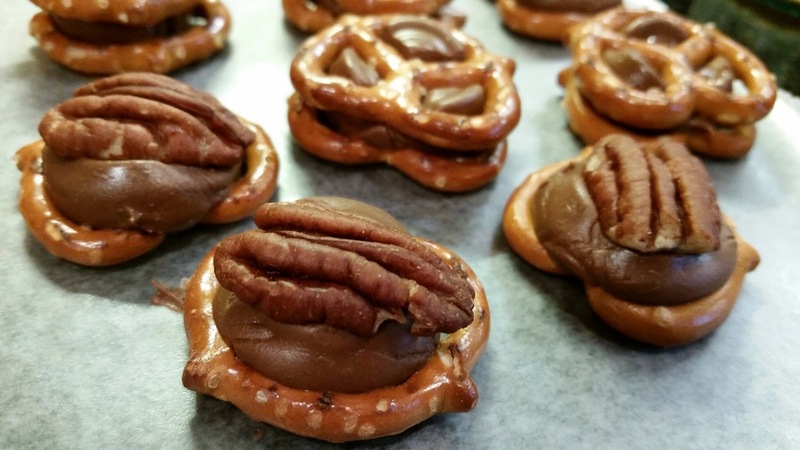 Remove from oven; top with either a pecan half or an additional pretzel, pressing down slightly. Cool completely. The recipe said to line the cookie sheet with parchment paper or foil, but I just placed my pretzels directly on my cookie sheet. That seemed to work just fine. 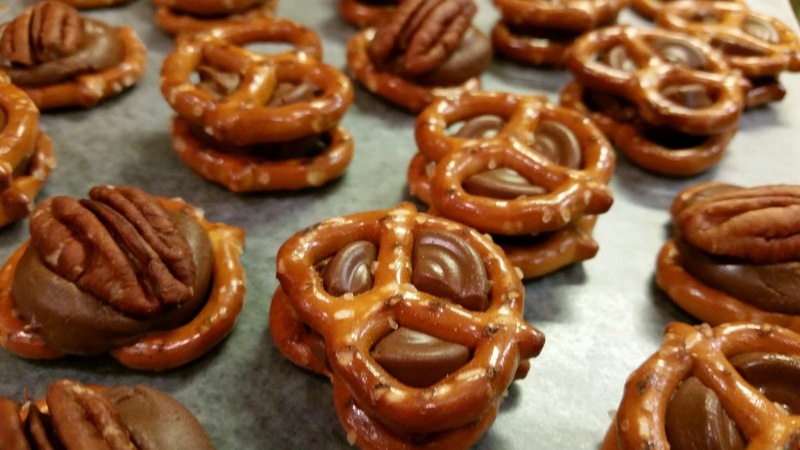 I did half with pecan halves and half with additional pretzels, and I liked them both. These are a really delicious and simple to make treat.